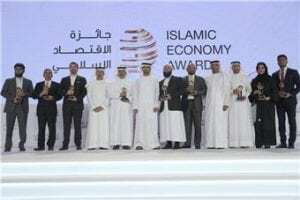 Dubai: Shaikh Hamdan Bin Mohammad Bin Rashid Al Maktoum, Crown Prince of Dubai and General Supervisor of the Dubai Capital of Islamic Economy initiative, on Monday honoured the winners of the fifth Islamic Economy Award. The winners were felicitated at a special ceremony held under the patronage of His Highness Shaikh Mohammad Bin Rashid Al Maktoum, Vice-President and Prime Minister of the UAE and Ruler of Dubai. Launched by the Dubai Islamic Economy Development Centre (DIEDC) and organised by the Dubai Chamber of Commerce and Industry (Dubai Chamber) and Thomson Reuters, the award ceremony was held in the presence of ministers and heads of government departments. The awards were presented to a cross-section of global and local business establishments in recognition of their innovative, world-class business initiatives and ideas that are Sharia-compliant and contribute to the social and economic welfare of the Muslim population. Ebrahim Bin Mohammad Bin Ebrahim Al Subeaei, chairman of the Board at Masic, Saudi Arabia, received the Lifetime Achievement Award 2017 on behalf of his father, the late Mohammad Bin Ebrahim Al Subeaei, former co-founder of Bank Al Bilad, Saudi Arabia for his contributions to the Islamic economy as well to charity. The Money and Finance category award was received by Yielders from the United Kingdom, an organisation offering Sharia-compliant investment opportunities. While the award in the Food and Health category went to Emirates International Accreditation Centre (EIAC), a governmental accreditation body based in Dubai that grants halal accreditation to conformity assessment bodies worldwide, the Media category award was received by OnePath Network from Australia, a film production studio that uses media to showcase the beauty and harmony of Islam. Recipients in other categories included Divine Connect from the United States of America in the hospitality and tourism category, Ihsan Trust from Pakistan in the Waqf and Endowments category, Dubai Technology Entrepreneur Centre (Dtec)–Dubai Silicon Oasis Authority from the United Arab Emirates for the SME Development category, and the International Sharia Research Academy for Islamic Finance (ISRA) from Malaysia in the Islamic Economy Knowledge Infrastructure category. Modanisa from Turkey was presented with the Islamic Arts category award. “The award ceremony is not only a celebration of individual and collective contributions that are driving the growth of Islamic economy sectors locally and internationally, but also a celebration of Dubai’s initiatives and the vision of His Highness Shaikh Mohammad Bin Rashid Al Maktoum that responded to the urgent global need to develop an ethical and integrated economic system,” said Sultan Bin Saeed Al Mansouri, Minister of Economy and Chairman of the Dubai Islamic Economy Development Centre. His Highness Sheikh Hamdan bin Mohammed bin Rashid Al Maktoum, Crown Prince of Dubai and General Supervisor of the Dubai Capital of Islamic Economy initiative, today honoured the winners of the fifth Islamic Economy Award. The winners were felicitated at a special ceremony held under the patronage of His Highness Sheikh Mohammed bin Rashid Al Maktoum, Vice President and Prime Minister of the UAE and Ruler of Dubai. Ibrahim bin Mohammed bin Ibrahim Alsubeaei, Chairman of the Board at Masic, Saudi Arabia received the Lifetime Achievement Award 2017 on behalf of his father, the late Mohammed bin Ibrahim Alsubeaei, former co-founder of Bank Al Bilad, Saudi Arabia for his contributions to the Islamic economy as well to charity. The Money and Finance category award was received by Yielders from the United Kingdom, an organisation offering sharia-compliant investment opportunities. While the award in the Food and Health category went to Emirates International Accreditation Center (EIAC), a governmental accreditation body based in Dubai that grants halal accreditation to conformity assessment bodies worldwide, the Media category award was received by OnePath Network from Australia, a film production studio that uses media to showcase the beauty and harmony of Islam. Recipients in other categories included Divine Connect from the United States of America in the hospitality and tourism category, Ihsan Trust from Pakistan in the Waqf and Endowments category, Dubai Technology Entrepreneur Centre (Dtec) – Dubai Silicon Oasis Authority from the United Arab Emirates for the SME Development category, and the International Shariah Research Academy for Islamic Finance (ISRA) from Malaysia in the Islamic Economy Knowledge Infrastructure category. Modanisa from Turkey was presented with the Islamic Arts category award. Al Mansouri stressed that DIEDC’s updated strategy and new initiatives, implemented in collaboration with its strategic partners, have created a favorable legislative and regulatory environment for Islamic economic institutions to ensure their significant contribution to the GDP through diversifying the sources of income and attracting foreign investment. Speaking at the ceremony, His Excellency Majid Saif Al Ghurair, Chairman of the Dubai Chamber of Commerce and Industry and Member of the Board of the Dubai Islamic Economy Development Centre highlighted the importance of the Islamic Economy Award in supporting the development of the Islamic economy sector. His Excellency Al Ghurair said: “The fifth edition of the Islamic Economy Award is a continuation of our efforts to establish Dubai as a global capital for Islamic economy. Dubai Chamber’s Chairman explained that Dubai has achieved considerable headway in its mission to become the global capital of the Islamic economy, in line with the vision of His Highness Sheikh Mohammed bin Rashid Al Maktoum. He described the Islamic Economy Award as a benchmark and celebration of Dubai’s progress on this front, and added that the Chamber would continue to provide valuable support to startups and businesses in Dubai operating within Islamic economy industries. Headed by His Excellency Hussain Al Qemzi, Chairman, Awqaf & Minors Affairs Foundation, the independent jury panel included Khalid Al Aboodi, Chief Executive Officer, Islamic Corporation for the Development of the Private Sector, Islamic Development Bank Group, Hassan Bayrakdar, Managing Director, RAQAM Consultancy, Dr Abdullah Qurban Turkistani, Dean, Islamic Economics Institute, Zulkifly Said, Director General, Islamic Tourism Centre, Rafi-uddin Shikoh, CEO, Dinar Standard, Professor Jonathan A J Wilson, Editor-in-Chief, Journal of Islamic Marketing, Dr Daud Bakr, Chairman, Shariah Advisory Council, and Dr Sayd Farook, Adviser to the Director General, The Executive Office of His Highness Sheikh Mohammed bin Rashid Al Maktoum.